When asked to name the most scenic Amtrak routes, frequent riders often name the California Zephyr (Chicago-Denver-Emeryville), and specifically the section that passes through Colorado. There the tracks follow the Colorado River for long stretches and pass through breathtaking canyons whose rocky walls frame ever-changing vistas. From the sightseer lounge car, one might catch glimpses of whitewater rafters in the warmer months. In winter, the snow-covered landscape steals the show. The California Zephyr carries the name of its predecessor, which entered service in 1949 between Chicago and Oakland, Calif., over much of the same route used today. It was operated jointly by the Chicago, Burlington and Quincy, Denver and Rio Grande Western (D&RGW) and Western Pacific railroads. As Amtrak plotted out routes in 1971 in preparation for taking over operation of most of the nation’s intercity passenger rail services, it preferred to use the D&RGW between Denver and Salt Lake City. The route offered natural beauty along the Colorado River, as well as connections to popular recreational areas such as Winter Park, Colo. Ultimately, the D&RGW decided not to join Amtrak and continued to independently run its Rio Grande Zephyr between Denver and Salt Lake City. Amtrak ended up routing its Chicago-San Francisco train—known as the San Francisco Zephyr after 1972—over the Union Pacific Railroad through southern Wyoming. In 1983, the route that Amtrak had desired from its earliest days was made possible when the D&RGW decided to discontinue the Rio Grande Zephyr, at that point the country’s last privately operated intercity passenger train. The Southern Railway, which also initially chose not to join Amtrak, had turned over its flagship Southern Crescent in early 1979. To celebrate the reroute of the San Francisco Zephyr to the D&RGW tracks, the train was renamed the California Zephyr. Led by P-42 locomotive No. 73, the westbound California Zephyr moves across the Front Range just outside of Denver. The mountain range, which is located in Colorado and Wyoming, earned its name due to the fact that it is the first chain of the Rockies that a traveler encounters when moving west from the Great Plains. Notable peaks include Mount Evans and Pike’s Peak. 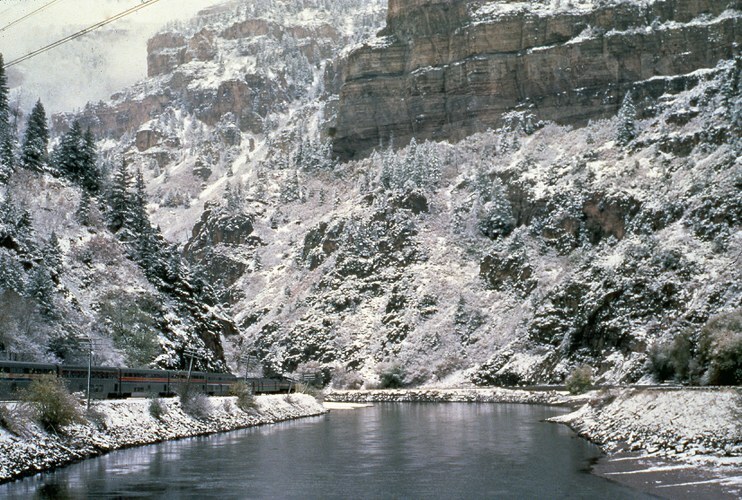 The California Zephyr skirts the Colorado River through the famous Glenwood Canyon near Glenwood Springs, Colo. The canyon stretches for approximately 13 miles and has walls as high as 1,300 feet. A natural wonder dotted with aspen and evergreen trees, it has been a highlight for rail passengers since the late 19th century. Glenwood Springs is a major year-round recreational center known for skiing, mountain biking and whitewater rafting. The historic 1904 depot on the northern edge of downtown is recognizable by its medieval-inspired towers with pyramidal roofs. In September 2003, the Glenwood Railroad Museum opened in the old Ladies’ Waiting Room. Exhibits tell the story of railroading in the Roaring Fork River Valley and include a large scale model railroad, photographs and artifacts such as a semaphore. 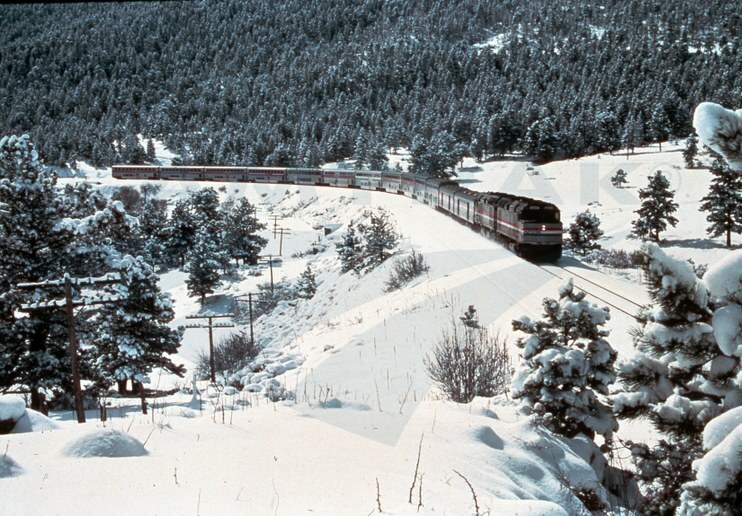 In this image taken near Crescent, Colo., the train is led by two F40PH locomotives wearing the Phase III paint scheme introduced in 1979. The bi-level Superliner cars they pull are a mix of Phase II (introduced in 1975) and Phase III. Crescent, located in Boulder County, is between the Amtrak stops at Denver and Winter Park-Fraser. The town of Fraser is referred to as the “Icebox of America” because its winter temperature has been known to drop as low as -50°F. 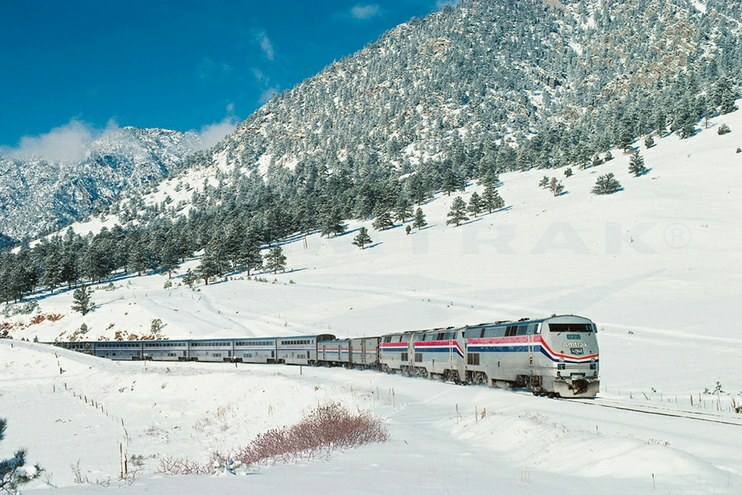 This image was used on a poster to promote Amtrak service to ski areas. 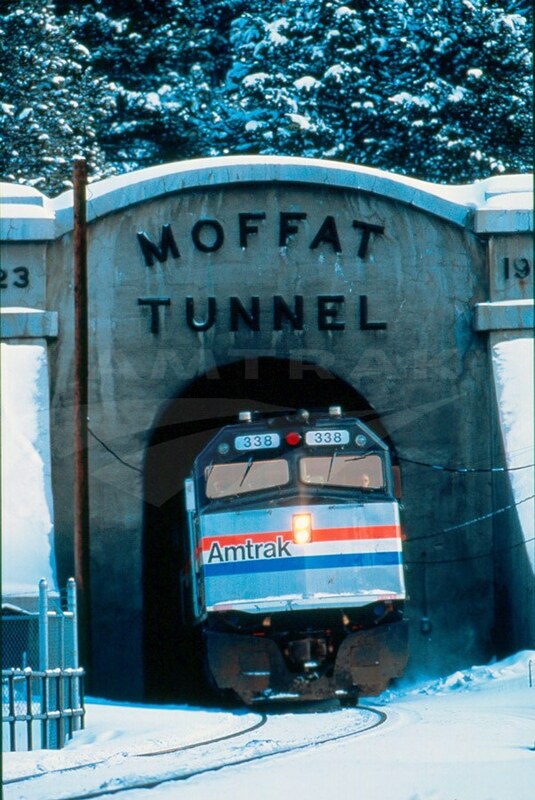 Here the train emerges from the western portal of the Moffat Tunnel near the Winter Park Resort ski area. The rail tunnel in north-central Colorado cuts through the Continental Divide and is named after railroad pioneer David Moffat. When it opened to railroad traffic in February 1928, the 6.2 mile tunnel cut the distance between Denver and the Pacific coast by 176 miles. Prior to its construction, the original Denver, Northwestern and Pacific Railroad crossed Rollins Pass with a series of switchback loops and steep grades, but the need for frequent snow removal in the colder months made this original route unprofitable. F40PH locomotive No. 357 leads the California Zephyr near Dutch Flat, Calif., which is a small community located between the Amtrak stops at Truckee and Colfax. Much of downtown is located on the National Register of Historic Places for its associations with late 19th century gold mining. The settlement was created in 1851, two years after the California Gold Rush kicked off at Sutter’s Mill. According to the National Register nomination, Dutch Flat was located on a freight wagon route that linked silver mines in California and Nevada, and it was also a stop on the Pony Express. The town has strong historic ties to the Central Pacific Railroad (CP), which helped construct the nation’s first transcontinental route. Theodore Judah, the CP’s chief engineer, used Dutch Flat as a base while he plotted the best path over the Sierra Nevada Mountains. Interestingly, Judah has a connection to Greenfield, Mass., a community that became a stop for the Amtrak Vermonter in December 2014. Judah worked on railroads in western Massachusetts and married a woman from Greenfield before pursuing work out West. Upon his death, he was laid to rest in Greenfield’s Federal Street Cemetery. 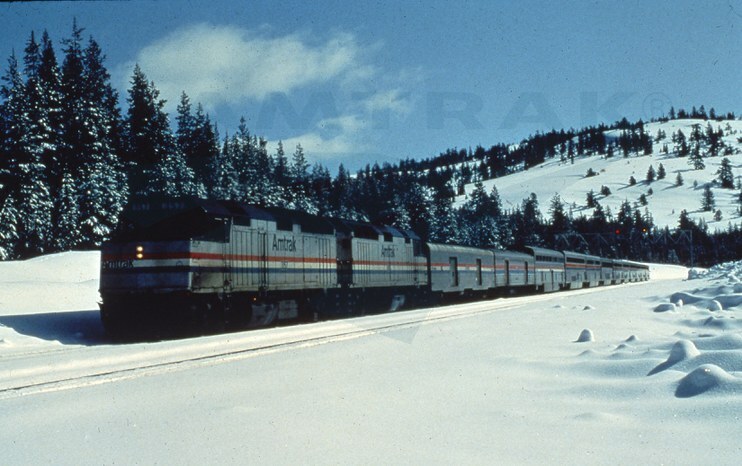 Do you have fond memories of winter travel on the California Zephyr? Share them with us in the comments section below.